Our Meat Departments' never-ending commitment is to provide you with the highest quality and freshest cuts of meat and ground beef available. Frank’s Supermarkets are proud to offer Tender Ridge Angus Beef. Tender Ridge Angus beef has the unmistakable flavor of old-world Angus. But this brand also has a commitment to tenderness and the modern know-how to ensure it. Tender Ridge Angus beef is grain-fed, hand-selected and optimally aged to ensure consistent tenderness. 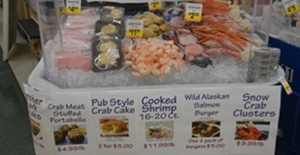 Visit our Seafood department where you’ll find a wide selection of healthy seafood, both fresh and frozen. 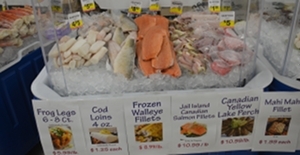 From jumbo shrimp to salmon fillets and seasonal favorites, you’ll find the best products from the lakes and oceans. 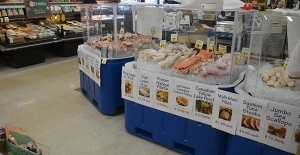 And watch for our special, limited time Seafood Roadshows for the most amazing deals on fresh, gigantic seafood choices. Be sure to stock up, because deals like these don’t come every month!